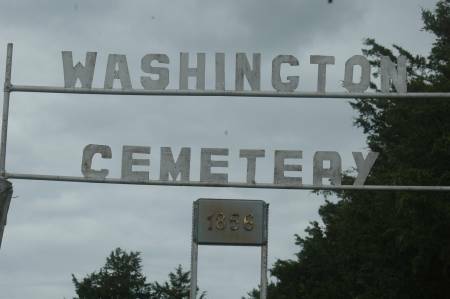 Washington is a Pioneer cemetery. This little cemetery is located on the southwest corner of the NW 1/4 of Section 10 in Sharon Township, Clinton County, Iowa. It is Washington Cemetery but was called Dickman Cemetery. Probably established in 1856 at the time of burial of the Hudson infant. The farm belonged to Hudson's at that time.Josiah is buried in Clinton County, Iowa in Sharon Township at the Washington Cemetery (1836, March 21, 1864- Co. F, 26th Iowa Volunteer Infantry, died at Davenport Hospital). He is buried with Charlotte (wife of Joseph Hudson, died September 15, 1863), Son of J.L.& F. Hudson (died Oct. 10, 1861 at age 2 years., 7 months, and 21 days), and infant daughter of J.L. & F. Hudson (1856, November 17) This is from the cemetery book located in the Jackson County Museum. From the book "The Story of Sharon" written by Florence Machande in 1998: "The Dickman cemetery, so named because in later years it adjoined the Dickman barn yard, was one of the earlier burial grounds. A Hudson baby was buried there in 1856, when the cemetery was part of the Hudson farm, which lies east of the Dickman place. A son of the Hudson, who died of disease in the Civil War, is buried there. Another Civil War veteran buried there is Hezekiah Gordon./ Many of the graves were later moved to the Smithtown cemetery and at one time the owner of the farm notified several families to move their graves which were on his land to a spot further east. Some moved them, but some of the families had moved away. When nothing was done a corn crib was built over the unmoved graves." Special recognition is given to the Friends of Clinton County Family History for compiling the info and the Clinton County Historical Society for sharing it with us. When available, the names are linked to the Gravestone Photo Project photo for that person. I DID NOT link to Family Monuments or if there was more than one photo of a tombstone. To make corrections to this list please contact the Clinton IAGenWeb County Coordinator.